It is as simple as 1-2-3! Buy your membership. We will email you a temporary card so that you can start saving thousands of dollars today, and will send you your permanent card in the mail as soon as possible. Your membership is valid for one year from date of purchase. 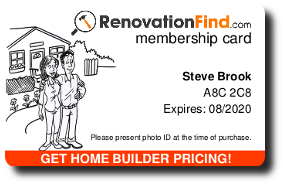 Review the list of companies in your area offering discounts to RenovationFind members here. Members deal directly with our partners; simply go shop for what you need. To receive your discount, show your membership card and photo identification at the time of purchase. As a member you can save up to 35% on your renovation and home improvement needs. It doesn't take long for your membership to pay for itself. Most members have it paid off with one purchase, or within a month or less. Best of all the more you spend, the more you save!